South San Francisco Scavenger Company is now offering businesses and multifamily dwellings the chance to participate in an innovative new program for food scrap recycling. This program uses a separate container to collect food scraps and food–soiled paper to create compost and fuel for collection trucks. This ground–breaking method of converting food waste to fuel is one the first of its kind in the country, and many have already signed on. Your business or multifamily residential property can benefit from potential cost savings and “green” business recognition when you use a food scrap collection container along with your garbage container. Plus, participating will help you comply with Assembly Bill 1826. The environment also benefits. Processing food–related waste in our state–of–the–art Anaerobic Digestion facility reduces greenhouse gas (GHG) emissions–compared to traditional composting–and it creates a clean–burning compressed natural gas fuel that will create less pollution in our community. 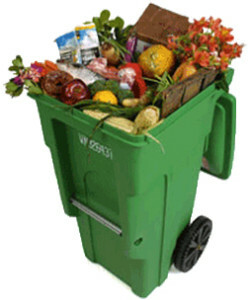 To participate, simply put food items, such as leftovers and trimmings, bones and peels in the cart along with food–soiled paper such as napkins, paper trays, paper towels, coffee filters, teabags and more.